Please note: No returns on bridles/nosebands they are custom made. The two ear, 2 buckle design on this bridle is made for mule ears. Handcrafted in the U.S.A, Amish made of 1/2" cowhide leather, heavy oiled. This Cowboy Whoa Mule Bridle beaded is made exclusively for Every Cowgirl's Dream. Headstall is decorated with dots. Adjustable custom made headstall for mules is approximate 32 inches measured at lariat noseband (bit to bit) on smallest setting and 45 inches at the largest setting. Comes with matching 1/2" x 7 ft 3 inch single roping rein with cowboy snaps. Includes copy of Retraining the Hard Mouth Mule. This makes for an all around mule bridle that will provide comfort and durability in the years to come. Every Whoa Mule bridle comes with a free copy of Retraining the Hard-Mouth Mule by Cindy K. Roberts. $15.00 value! 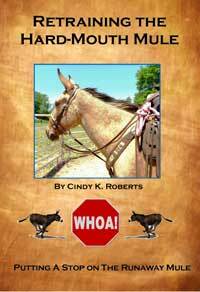 Complete instructions on proper use and how to adjust your bridle is included with your purchase of the Whoa Mule bridle in this book. The hardware works underneath the jaw area on the mule. When rein pressure is applied, the hardware applies pressure underneath the jaw working in conjunction with the noseband that pulls the mule's nose back down to where it should be. This is an effective piece of equipment to use in your training program. Once your mule has overcome his bit behavior issues, you can go back to using a bit that your mule likes or keep on using the Whoa Mule Hackamore bridle. More mules prefer using the Whoa Mule Hackamore bridle over having a bit placed in their mouth. 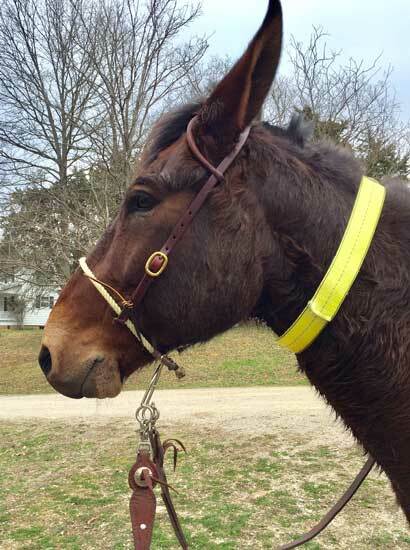 Read how mule riders/handlers have benefited from using the Whoa Mule bridle! The two ear, 2 buckle design on this headstall is made for mule ears. It is handcrafted, Amish made in 1/2" cowhide leather, heavy oiled. This is Cowboy Mule Bridle is made exclusively for Every Cowgirl's Dream. Adjustable headstall is approximate 32 inches on the smallest setting. Adjusts to 44 inches on the longest setting. Amish made. Select your size noseband. Comes with matching heavy oiled 7 ft split reins.